After a decade of advocacy efforts, education and awareness-raising by the women’s movement, Armenia has adopted its first stand-alone law against domestic violence. 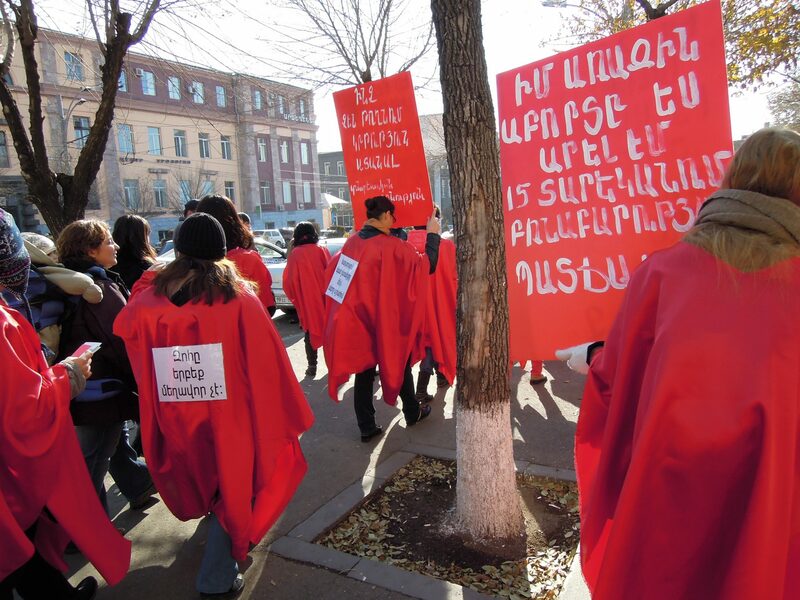 A protest march in Yerevan on November 25, the International Day for the Elimination of Violence against Women. Photo: Sara Hurtig. A group of Kvinna till Kvinna’s partner organisations coordinated the call for change by forming the umbrella Coalition to Stop Violence Against Women. However, many women’s rights organisations are critical of the new law’s emphasis on upholding family values – rather than on protecting women survivors of abuse. The title of the law, for example, ends with the words “restoring harmony with in the family.” This phrasing is believed to be a direct result of conservative pressure. On the positive side, many hope the new legislation will strengthen law enforcement agencies’ mandate to protect victims. In the coming months, Kvinna till Kvinna’s partners in Armenia will focus on monitoring the implementation of the law and lobbying for amendments.